Indium - 49In Your user agent does not support the HTML5 Audio element. Indium atoms have 49 electrons and the shell structure is 2.8.18.18.3. The ground state electronic configuration of neutral indium is [Kr].4d10.5s2.5p1 and the term symbol of indium is 2P1/2. Indium: description Your user agent does not support the HTML5 Audio element. Indium is a very soft, silvery-white metal with a brilliant lustre. The pure metal gives a high-pitched "scream" when bent. It wets glass, as does gallium. It is useful for making low-melting alloys. An alloy of 24% indium and 76% gallium is liquid at room temperature. Canada produces the majority of of the world's supply of indium. 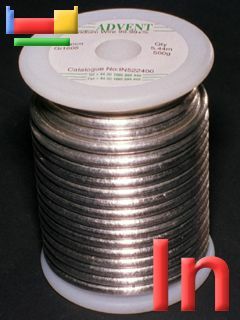 Small and large samples of indium wire like this, as well as foil, and sheet, can be purchased from Advent Research Materials via their web catalogue. 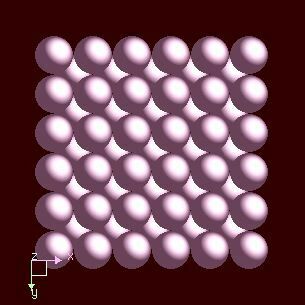 The solid state structure of indium is: bcc (body-centred cubic). Indium has no biological role. In small doses it is said to stimulate the metabolism. Reactions of indium as the element with air, water, halogens, acids, and bases where known. Binary compounds with halogens (known as halides), oxygen (known as oxides), hydrogen (known as hydrides), and other compounds of indium where known. Bond strengths; lattice energies of indium halides, hydrides, oxides (where known); and reduction potentials where known. Indium was discovered by Ferdinand Reich, Hieronymus Theodor Richter in 1863 at Germany. Origin of name: named after the indigo line in its atomic spectrum. Isotope abundances of indium with the most intense signal set to 100%. 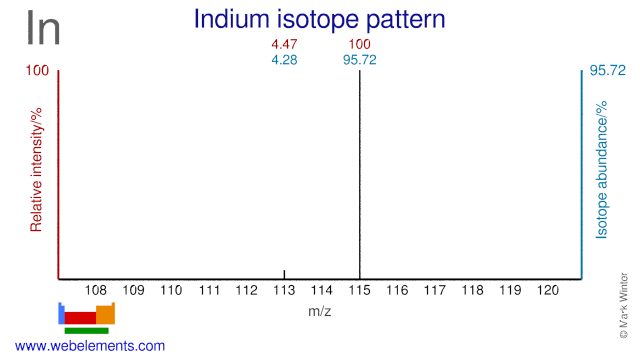 Indium has two stable isotopes and one of them, In-113, is used for the production of radioisotopes. In-113 is used for the production of Sn-113 and can also be used for the production of the medical radioisotope In-110, although the most common production route for that radioisotope is via Cd-110. Isolation: indium would not normally be made in the laboratory as it is commercially available. Indium is a byproduct of the formation of lead and zinc. Indium metal is isolated by the electrolysis of indium salts in water. Further processes are required to make very pure indium for electronics purposes.